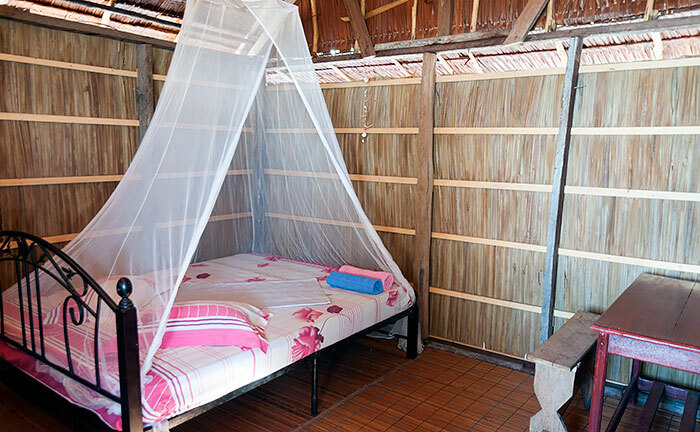 Delvin Homestay is located on the north shore of Kri and offers the following choice of bungalows. 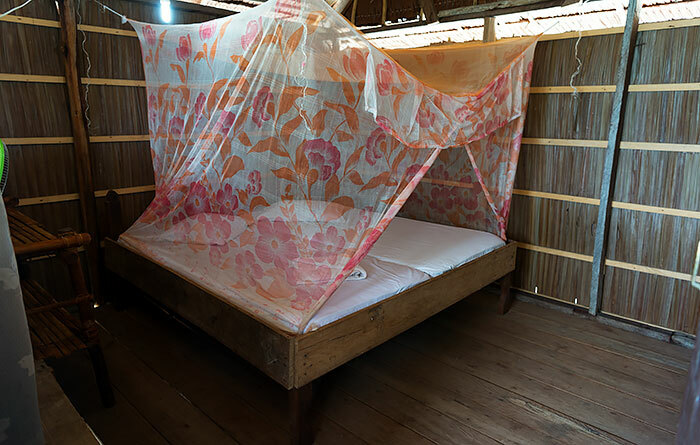 The VIP bungalows have tiled concrete floors, ensuite bathroom and toilets, real double beds with sheets, covers, pillows and mosquito nets, a small wardrobe, a desk and an electric fan. They also feature glazed windows, a solid lockable door and small tiled verandahs with seating. 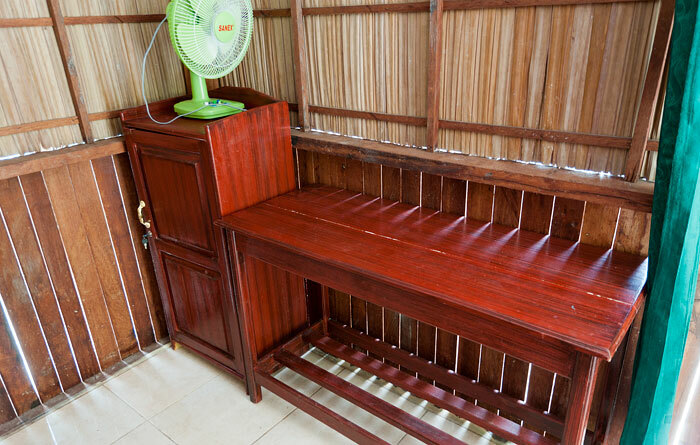 Wooden racks for drying wet towels and clothes are also provided. 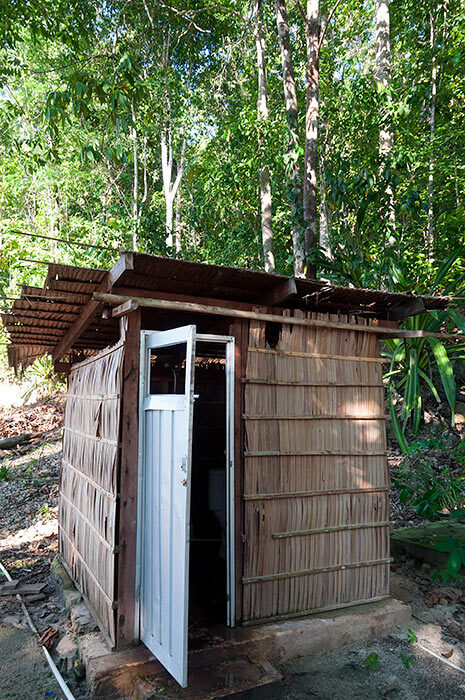 VIP bungalow ensuite bathrooms have western style toilets, but no showers. The homestay standard bucket bathing or “dip mandi” is provided. 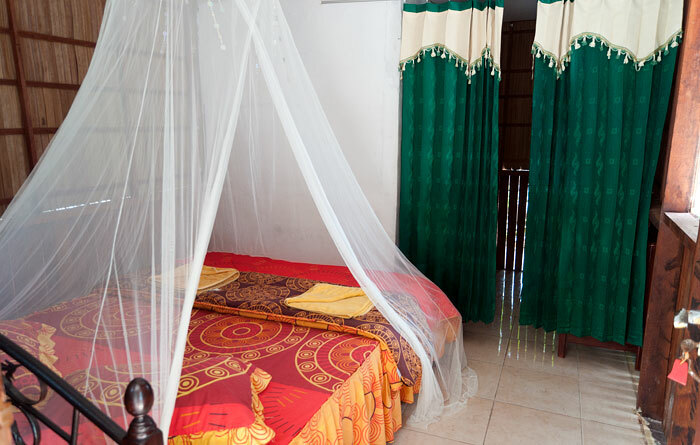 Delvin Homestay also offers five more traditional style private bungalows. Two of those are on the beach, and three are on land. These private bungalows have similar features to the VIP bungalows, including a double bed, power outlets and room light switches, a clothes drying rack etc. A single over-water private bungalow is also available and is similarly furnished as above. 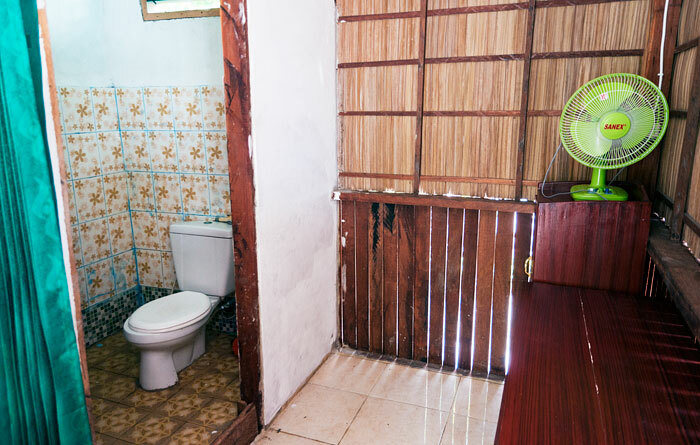 Bathroom facilities for beach bungalow guests are provided in a nearby concrete floored building which houses a western style toilet and dip mandi bathing facilities (a shower is also installed for when the water pump is running). 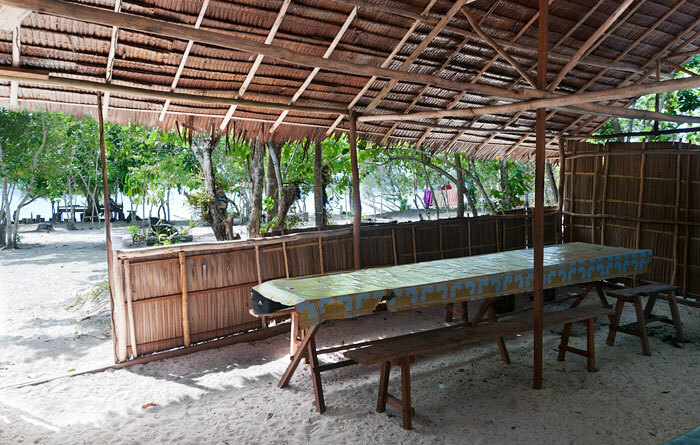 Meals are served in Delvin’s dining shelter at a large table that has bench style seating. Drinking water, tea and coffee are always available there. 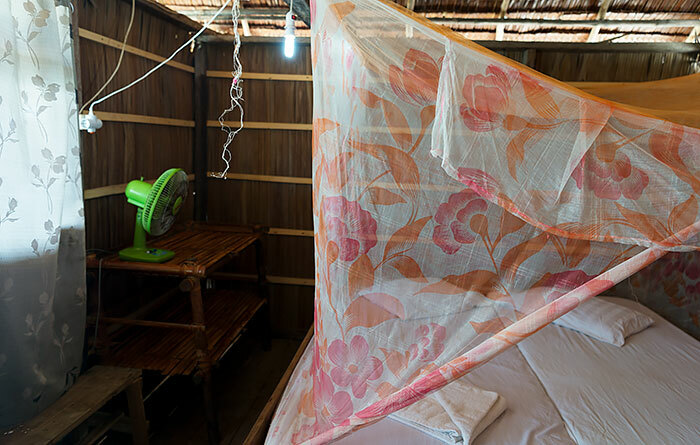 Electricity is supplied by generator at night and the bungalows have power sockets and room light switches. Delvin Homestay receives a fairly good mobile phone signal which will usually support a data connection. The nearest village where you can buy basic supplies is Yenbuba on Mansuar. 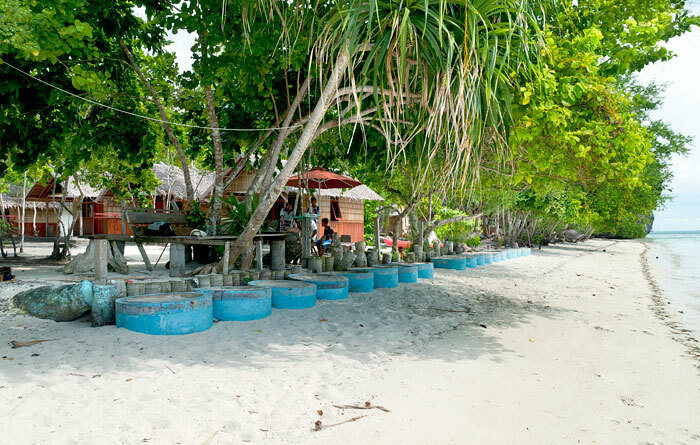 Yenbuba is about a fifteen minute boat ride away and can also be reached on foot via sandbanks exposed at low tide. Only minimal English is spoken at Delvin, so be sure to bring a phrasebook if you have no Bahasa Indonesia. Transport from Waisai to Delvin Homestay is by speedboat and costs IDR 600,000 each way for 1 to 5 passengers. If more than 5 passengers the cost is IDR 100,000 per person. The boat can carry up to 10 passengers. 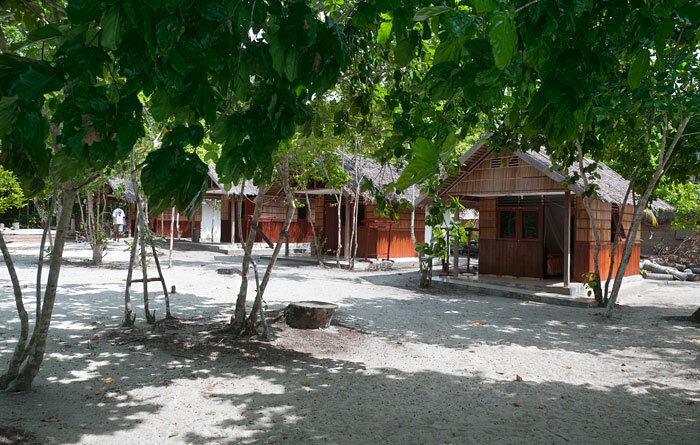 Delvin Homestay’s location between neighbours Mambetron Homestay and Mambei Homestay means that, like all Kri homestays, Delvin has a great house reef and offers a range of activities. Be sure to bring your own snorkelling gear to make the best of it! 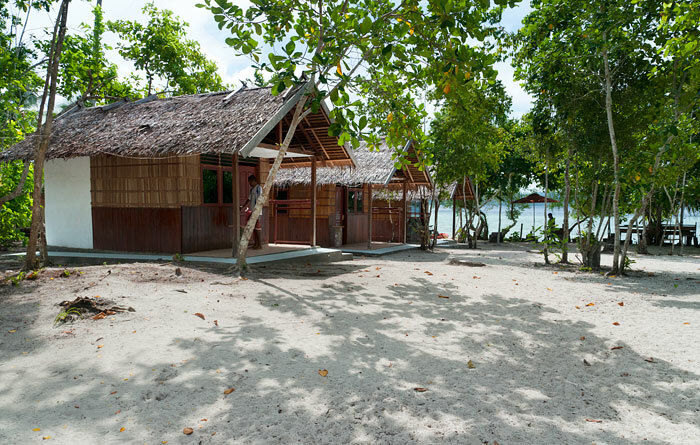 Diving: Diving is available at Delvin Homestay in association with other Kri homestay dive centers. Long north coast hikes are possible at low tide and there are trails leading to a panoramic lookout on Kri’s heights that provides spectacular views over the neighbouring islands of Ransiwor and Mansuar, south across the Dampier Strait to Batanta and north to Gam and Waigeo. In addition to long beachwalks on Kri, at low tide it’s possible to cross the sandbanks that join Kri, Ransiwor and Mansuar. The sandbanks are a great attraction in themselves, as they afford the chance to see a host of marine creatures trapped in small pools waiting for the tide’s return. The exposed sand gives access to Ransiwor, the small island between Kri and Mansuar which has excellent snorkelling around its southern shores. Beware of strong currents there though – especially once the tide begins to run. You can cross to Mansuar to visit Yenbuba and then continue along a well made trail along Mansuar’s north coast all the way to Yenbekwan if you want. Be aware of tide timings though – otherwise you’ll need a boat to get you back to Kri. Tours are by speedboat capable of carrying up to ten passengers. The prices are per tour and are split among passengers. All tours include lunch. In addition to the above, Delvin can organise sightseeing and snorkelling trips to any location you wish. Ask about those. Prices will depend on trip duration and distance. We had a great stay at Delvin. The over water bungalow is fantastic. Excellent food, fruits, fish, chicken. Danny is a very experienced diver and knows the good places. Thanks for a great time! I just wanted to ask if there is anything I should do concerning the following booking. It has already been confirmed but I wanted to make sure it’s all settled. With the exception of sending your first host an SMS text message when you board the ferry in Sorong, there is nothing further you need to do in relation to any bookings for which you have received a confirmation email. i stayed 7nights in the over water bungalow (without in house bathroom). I really enjoyed my stay in the Delvin Homestay. 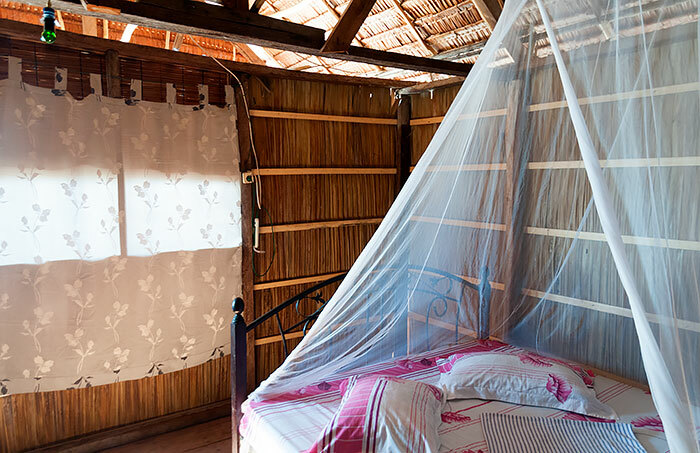 I’m happy because i didn’t read the last reviews about this homestay before i arrived. My experience about the Delvin Homestay and the owner Dani is positiv. The owner Dany and his family was very nice and helpful. The food was tasty and the wife was very flexible to provide the food when i had to leave for diving early in the morning. The bungalow was basic (like in the most of the Homestays) but clean sheets on the bed. The view, sunset and snorkelling in front of my bungalow was amazing. The only negative point was the bathroom situation WC & Shower. They had some problems with the sweet-water pipe. The water for the shower was salty. I guess … they fixed it now? I didn’t book any trip with Delfin- i was diving with Yenkoranu dive center every day- and the diving was great. All in all i was very happy there. I would go back to the Delfin Homestay. Thank you very much for you great hospitality. 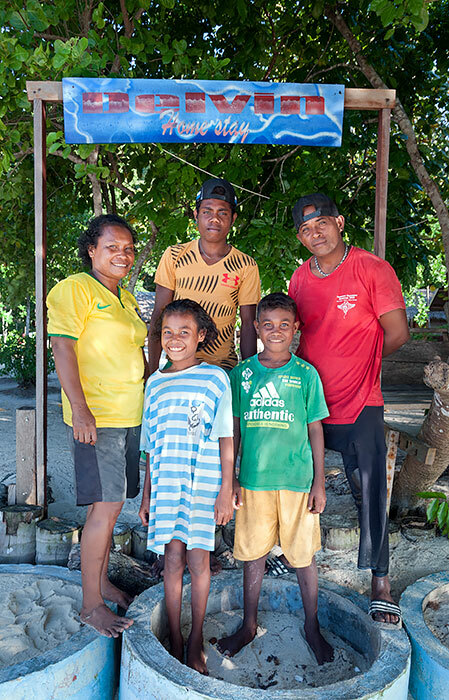 Delvin’s homestay is a great example for what happens as so much money gets pushed towards Raja Ampat at the moment – people’s only interest is to make the most possible profit and don’t care if the guests are happy. Our VIP bungalow was dirty, wet, small and dark. There were just a few options to store our belongings off the ground which you should do because you are sharing your space with rats. 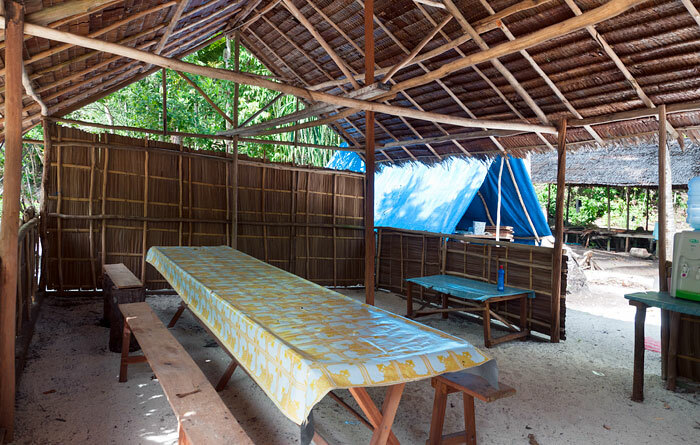 The common area lacks space to hang out, no hammock with the VIP bungalows and no beach during high tide on Pulau Kri. We arranged trips with the owner but got repeatedly dumped because more profitable possibilities emerged. So, we ended up wasting a lot of valuable time. When addressing our dissatisfaction, he reacted really aggressive and told us literally to f*** off. The food was decent but nothing special compared to other homestays. We’ve stayed in numerous places in different regions of Indonesia, this was the one horrible experience. It’s very sad that your experience at Delvin was so awful, and it’s important that other guests know about these problems. We’ll make sure your feedback reaches both the Homestay Association and Delvin’s management. We didnt stay at Delvin – just next door, but we tried to book a few trips with them! On our first day, we met a few young people that had been waiting 3 hours to go on a diving trip that they’d previously booked, only to find out that the boat had taken some other tourists who offered to pay more and they were quite upset as they’d hoped to go to Manta point. The dive masters were of a usual standard, however pulling at a bamboo sharks’ tail to make it swim was not great. We tried to do a day trip snorkelling and to Pianemo with them, but after sitting on the boat for an hour trying to get one of the engines to start, we had to abandon the whole trip. They said a full refund would be given and would we like them to take us to our next homestay the following morning and deduct from what we’d be refunded, which seemed fine. We arrived at 9:00 only to be told that Danny had taken the boat to take someone diving instead and no-one knew when he would be back… however he was apparently the only one with any money to refund us the 1.2million we were owed. We therefore had to wait around until 12:30 until he finally came back, when he said he’d refund us and take us after lunch! We eventually got there and got our money back but wasted half a day when we could have been snorkelling / enjoying our short time on Kri. A lot of the people we met staying here also moved due to rats and poor sanitation. Stay away from this home stay! The wo er is very very rude! Terima kasih untuk komentar anda semoga anda baik-baik saja. It was an aweful experience! I stayed here for a couple of night in Febuary 2018. The owner Dani was so unfriendly and didn’t care at all! He left us waiting for 2 hours once for a boat trip (and then the engine broke). And once he didn’t show up at all although we had a trip booked!! In the end we couldn’t enjoy Raja Ampat at all. The food was okay but nothing special. All in all I wouldn’t recommend it at all! It was horrible. STAY AWAY FROM DELWINS HOMESTAY!! – The on land bungalows are worn down and quite dirty. – Rats in the bungalows. Keep you food in the public fridge! – Food was decent, fish and rice in different varieties and there were always mangos or bananas for desert. – There is no good place in the common area to hang out and chill. During high tide, there is no beach on Pulau kri except at the western tip (take a look at the Homestay at this part of the island). 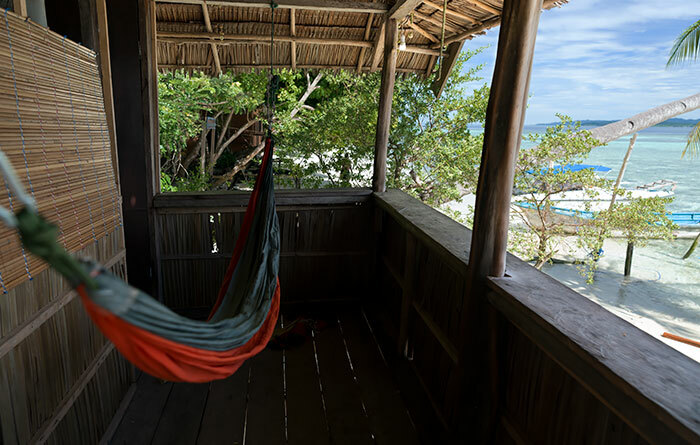 If you stay at a beachside bungalow, you have at least a hammock and a little balcony in front of the bungalow. 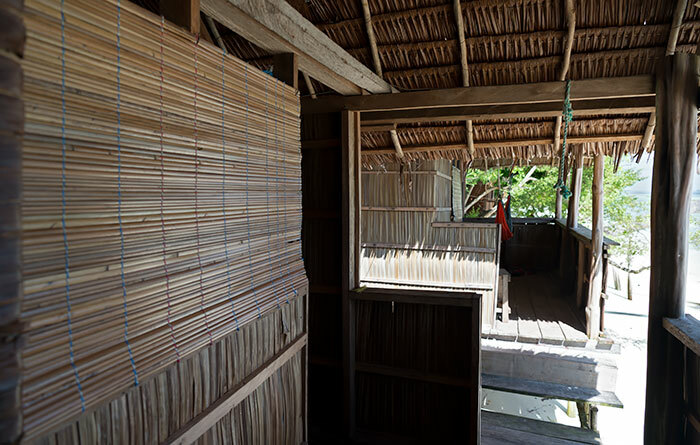 The on land bungalows are small and cramped and have no hammock or other kind of place to chill. 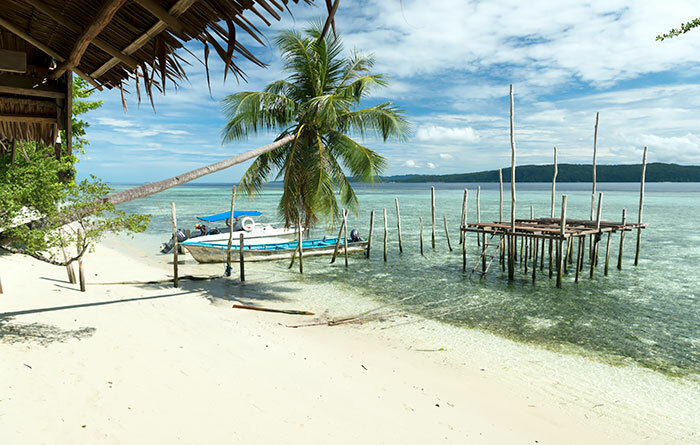 TL:DR: Stay elsewhere in Raja Ampat, mostly because the guy that runs this place is only looking to make a few fast bucks and does not care about his guests at all. We stayed 2 nights at Delvin Homestay with 9 people. No regret at all, ensuite bathrooms with VIP rooms is more than enough. 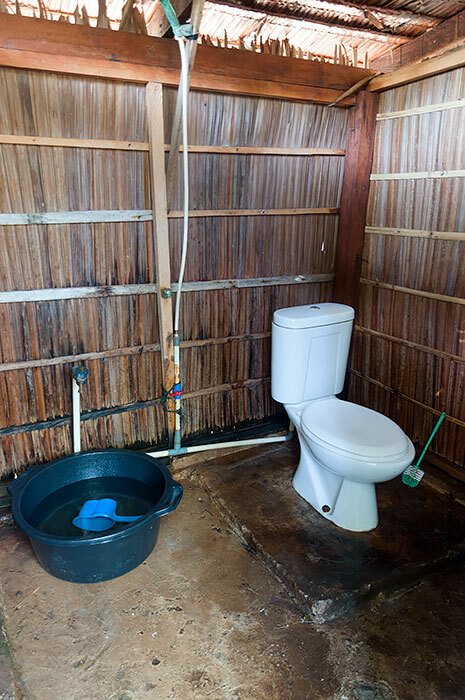 As we know, ensuite bathrooms is not much at Raja Ampat. The owner, Dani was a wonderful kind guy, the food is all good and tasty. The room is clean & tidy. Snack evening is good. We’ve been at Delvin Homestay on July 2017. It was a beautiful choice. Danny and his family are very kind. 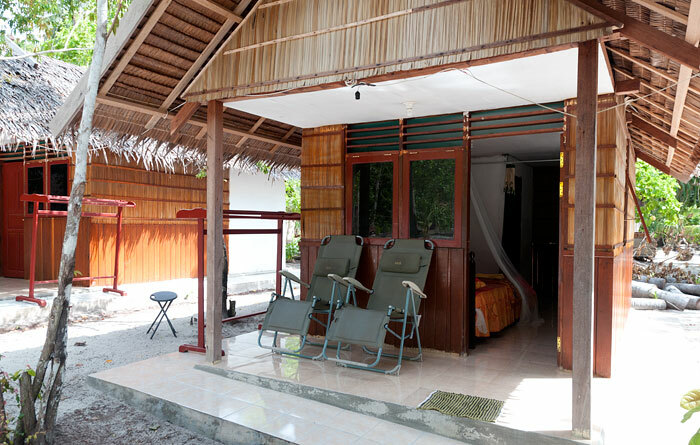 We stayed in a comfortable bungalow close to the beach and with the private bathroom. The food was great and various, the location is directly on one of the best reef of Kri Island (few meters off the beach) where you can see always turtles, sharks and million coloured fishes & corals. Absolutely positive experience! No reason to take VIP bungalow because it’s terrible wet inside, very low ciling, no air coming inside and many moskitos. Better way – a bungalow with shered toilet and tall roof. Exactly. But food was very tasty. We were staying 5 nights with my partner here are plus and minus. – They charge you for snorkeling for small tour over price but you dont have many option as well in the island because they charge you more and less the same. We stayed 12 days on a VIP bungalow. It’s good to find a little confort. 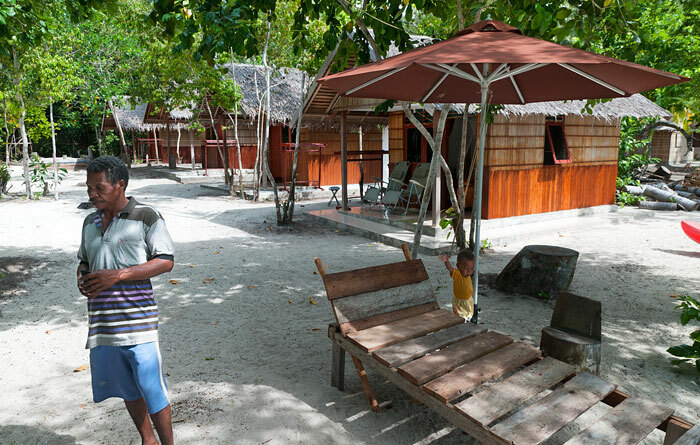 In front of the guest houses is the fantastic place for snorkelling. The food is very good and enough. Daniel is friendly , it’s sometimes necessary to give some explanation to understand. Thanks for all !! J’ai vraiment apprécié mon séjour au Delvin Homestay. Bien sûr, c’est un Homestay sur l’île de Kri et le confort “moderne” n’est pas de mise. 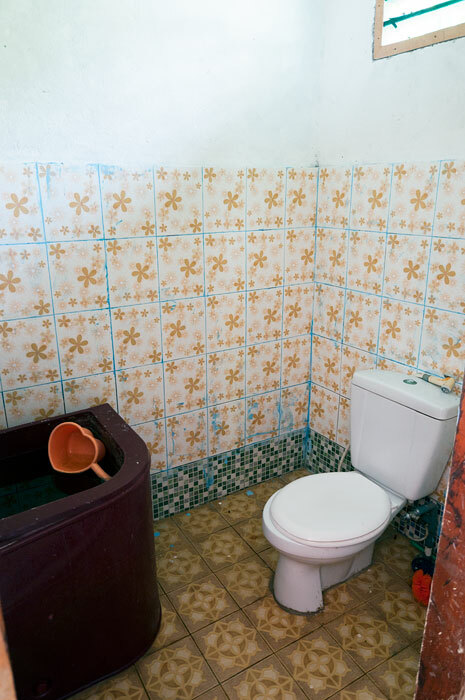 Ceci dit, les bungalows sont récents, ils ont une salle de bain “privée” (rare sur Kri) et surtout la nourriture est excellente, variée et abondante. Dani est attentif aux demande et il parle bien anglais ce qui n’est pas le cas de tous les homestay. Je prévoie un autre séjour à Kri en septembre et je retournerai au Delvin Homestay ! Nice homestay. Clean rooms, small fan provided, private bathroom with western toilet. No shower. Very good food and plenty. Dani is a nice guy, speaks English and he’s helpful. We spent 2 nights at Delvin, as a family with a 5 yrs old kid. Nice homestay, and the “VIP” rooms are a good deal. Food better then average and with variety (even chicken on last day). Dani is a really nice guy. He arranged to join the Yenkoranu boat transfer from Waisai, saving me a lot of money. He replies fast to SMS and speaks decent English. Only issue with this homestay is that thers is no good place to watch the ocean from. The bungelows face sideways towards another homestay that is currently under construction. Not really nice. Towards the sea are trees. But you can go to Yenkoranu, buy a beer and use their hammocks. 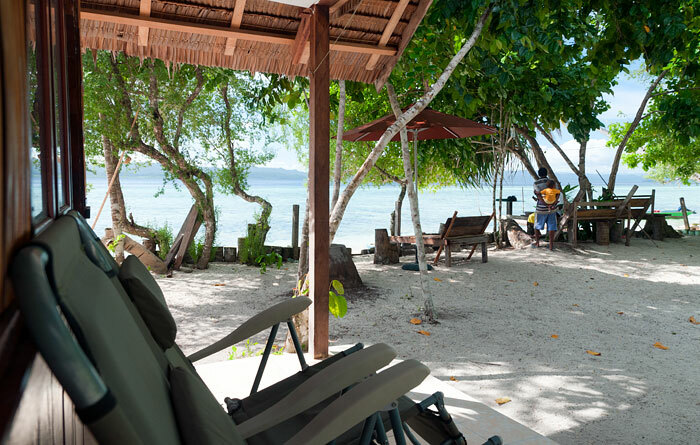 If you want an ocean view from your bungalow, book Mambetron (if you can get them to reply….otherwise just turn up). Main advantage of North Coast of Kri is that across the 6 homestays there you can easily get a group together for longer tours (such as Manta or Penemo/Fam). Of course for the same reason, you dont get a Robinson Crusoe / paradise feeling, more like a “normal” backpacker beach. Btw while the snorkelling in front of the homestay until Kri Eco Lodge is good by normal standard, it is really not that great for Raja Ampat. 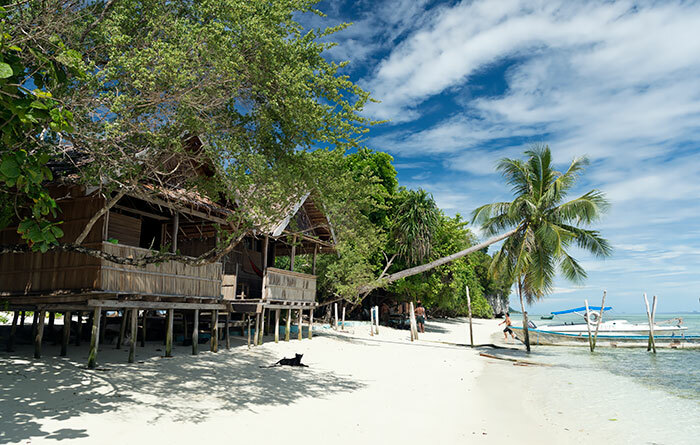 For best snorkelling from the shore, nothing beats staying in Mansuar and swimming at Yenbuba Jetty. See my review for Koryau Kayem. We spent also 6 nights there. Kind and helpful family. Nice dogs and parrots there. Good diving and snorkeling on the house reef possible. Equipment and dives with a guide are available at Yenkoranu. The equipment is not the best. You have to do a safty check by yourself bevor diving, or bring your own equipement with you. I would recommend a computer at least. Kri Island and Ramja Ampat is one of the most beautiful things i have ever seen. We have spent 6 nights at this Homestay in Kri Island at the beginning of April, 2015 and were first guests in here. The nature around is wild and beautiful. A good snorkeling is just in front of the Homestay. 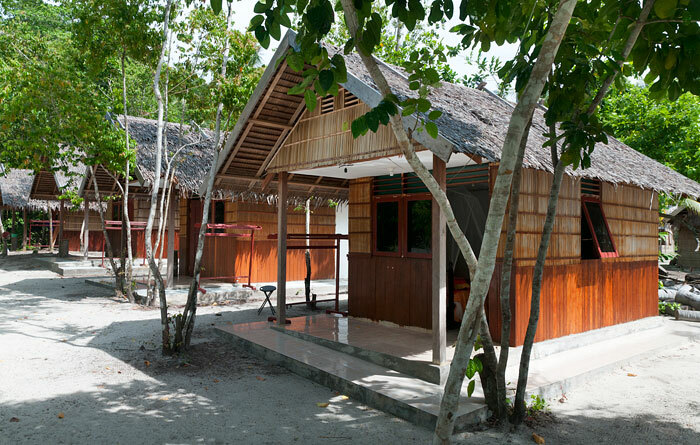 All of four bungalows stay perpendicularly to the beach and all of them have en suited bathrooms “mandi” style. Clean beddings and towels are provided. The owners, Mr. Dani and Mrs. Balandina, are very kind and helpful. She’s a good cook, serving delicious three meals a day. He is advanced diver joining the guests for the diving. 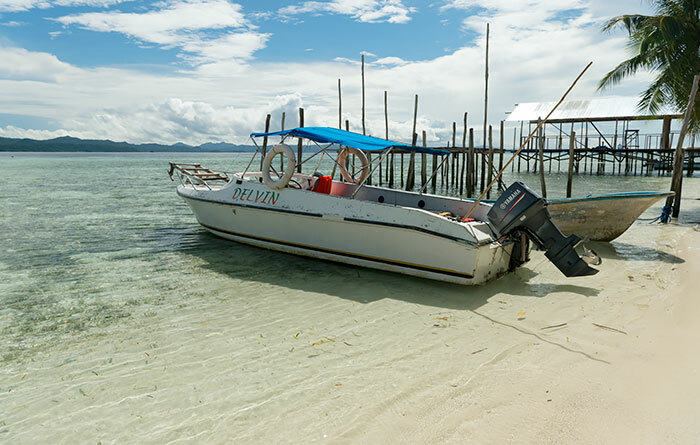 As Delvin Homestay is near to other homestays, it’s easy to find tourists to cooperate and share the price for the boat trips visiting Raja Ampat. Dani speaks English, but not fluently, so, for reservations, he prefers text messages +6282239307439. Telecommunications in here are unreliable, so if you will not receive an answer, just keep trying. They are really waiting for guests. Overall it was a great stay at very reasonable price.